My personal take on the Parker "Direction". I love the way my 2004 Mojo looks, and my old MIDIFly (let's call it Nitefly for the purposes of this as that's it's style, it just has a shed-load of extra circuit in), but sometimes the simplicity of having a guitar you can just hang on a wall hanger is nice for a start. The old headstock looks kinda cool, but the new one with the two-tone look on the DF and some of the Mojos on the website wins in my opinion. Has all the futuristic look of the old, but I think the extra curve in a different colour adds to it's overall visual appeal. Still "interesting", but less insect-y (an ironic comment for a fly I know). It could even have less flare right at the end so it looks less square. Anyway, new headstock is nice, any more than that is picky. Can't adjust the truss rod so easily so a functional step slightly backwards, but you can't do much about that. It looks cool. I don't find it that uncomfortable very often, but sometimes it's a little pokey. IMHO I'd like it rounded out just a little bit whilst retaining enough thickness for strength, but not as much as the Maxxfly though. That has gone a little normal for my tastes. Somewhere between the two, but erring definitely towards the original. My Nitefly doesn't seem as pokey as it's a lot thicker, but it should be eay to retain more of the original look without so much poke. The neck is why I bought my Parker. Well, the neck and the tone, which is a byproduct of the thin resonant body and neck, both with reinforcement. To me if it doesn't have that, then it's not really a proper Parker in spirit. It's the magic ingredient else I may as well start looking about at other very nicely made hand-crafted custom guitars. Pure wood is good, but there's a lot of pure wood good out there to choose from. I instantly lose interest in the all wood ones. They're still cool guitars, but there's lots of cool guitars in the world. I'd quite like the option of more jumbo frets on a fly though. The tension wheel and step stop issue. Why did it go! I've never owned the old one with a step/stop switch and tension wheel but I still get annoyed I don't have one when I have to adjust mine. This guitar has an amazing trem. You can lock it fixed/bend down only, or have it floating. You can also lock it while retuning (especially helpful going standard to drop D say), then unlock and adjust tension for same balance and flat trem, far superior for intonation. But why do I need this silly metal stick? Why can I not slide a thing with my finger and use a big thumb screw? I can actually lock, tune, and unlock the old style on stage. I'm not gonna take a pointy stick with me. I often play bend down only on stage as if I go to drop D it's a PITA to retune on any floating trem. If I break a string I'm stuffed for the rest of the song if floating. I see so many reasons to have it but it's gone. It almost makes me want to buy an old 2nd hand one just for the step-stop. Many refinements have been made to the fly. Taking away the tension wheel and a finger-accessible step-stop switch definitely weren't one of them. The only limitation I saw to the previous version still remains, you can over-tightn the spring if you can't see what you're doing. But this still remains. A little slot so I can make sure I haven't exceeded those 15 max recommended turns would be handy. Obviously this doesn't apply to the Nitefly, but the Nitefly trem isn't as flexible. I just accept that. Therefore it's not nearly as frustrating as having all the possibilities of the Deluxe/Mojo Fly, but half-spoiled cuz you need a little metal stick to get to that great functionality hidden by a bit of plastic. I also have to be careful what strings I put on as some brands back-winding (if that's what it's called? ), is longer than others. This means some brands don't sit properly on the low E (and occasionally A). If the bridge was fractionally longer on the bass side by a couple of mm it'd be nice. Especially with heavier gauge strings. The pickup cavity in the true fly limits the options. Since loads of my friends swear by and all have great experiences with Bareknuckle Pickups it'd be grand if you could have a BKP option or 2. Or they want something harder than the Dimarzios, but don't like the tone of the JB. Sure the mixed Mag/Piezo sound is cool. Lots of people use it. Personally I never do. My problem is I have little use for it, and so if I use a mono guitar lead into my amp the mag pickups are active. This means any of the vintage style fuzzes from classic Hendrix-style fuzz faces to modern Muse-sounding ZVex Fuzz Factories won't fuzz properly. Being the weaselly chap I am and having RTFM, I use a special mono lead I made up with a stereo end so my smart-switch thinks it's a stereo lead so sends out the mags un-buffered, and the piezo goes no-where. Hurrah! Proper fuzz! Apart from my piezo is useless (not much of a problem), but I have to always have a battery in, even though I'm just using the mag pickups mono. Is there not a more sensible method where I can have an active bypass for mag pickups? Maybe this is just me being odd again. I guess I could always hard-wire. Niteflies and pick guards: Make another Southern Nitefly! My mojo is the heavy thing proper rock thing. The Nitefly is the bolt-on, alder-body, strat version. I like my pick guard. It makes it have more of the vintage appeal of a strat with that 5-way, sparkly pick guard, and the HSS pickup config. Also, what I really wan a get next when I have some cash is a Southern Nitefly. I want a tele, but with that added Parker vibe, stainless frets and carbon fibre/epoxy neck/fingerboard. 2nd hand they seem pretty rare, and I reckon if there was another version of that but with the "slightly less freaky" headstock it would sell, and I'd instantly be saving for a butterscotch one. Re: My personal take on the Parker "Direction". Nice dreams. I remember many years ago there was a similar thread. I think the main thing I would like to see is a push for more tonal options and a low maintenance, balanced, light 4 pound guitar. To accomplish that probably means retaining carbon but I'm not an engineer and I haven't played the new carbonless Parkers. I agree the fret board is key. The looks are secondary to me. I like the looks of the new Max design just fine but its nothing striking like the "Classic" Fly was. Its tough to read where "Parker" is going or if they are surviving. Someone correct me if I'm wrong but it seems they are no longer a production guitar. Is it custom order only now ? I believe Parker guitars were born to solve the practical problems guitarists have with their guitars. 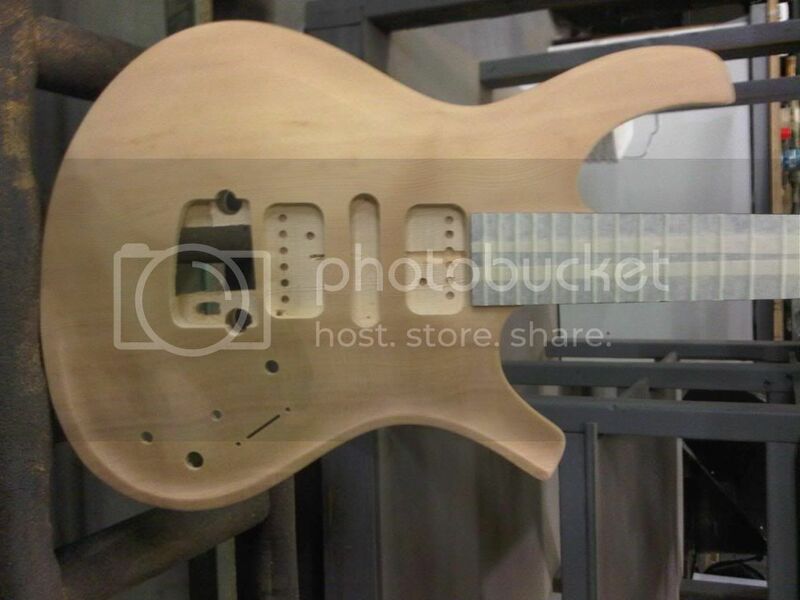 They have been succesful in creating a lightweight resonant guitar with a great neck and good features. I am guessing the next challenge lies in the 'tone' aspect of things. I am thinking the Dragonfly and the Mojo were good steps in the evolution here. But I really hope it is not going to stop there. I'll stop my rant here. I really like the new upper horn myself.. Also the Step Stop/Tension wheel is still there, just only on the DF8xx models. From what I can see Parker is alive and well, and I think their production line is reflective of survival and the custom shop is reflective of perseverance. I think the new all wood Parker guitars could eventually make a Parker resurgence and find it's way to Guitar Centers and such. The new bolt on with carbon fret board seems like the best compromise to still get the feel of a Parker but the production cost of traditional construction. For the purest the original designs are basically still available as a custom order. I know they have the self tuning guitar as an option. But a full carbon wrap Fly with midi and self tuning and such is like a $6000+ guitar. So I doubt that would ever be more than a custom order. Nice wish list :-) I'm actually thinking about putting a clear plastic window into my pre-refined's back-shield so I can see the spring and trem wheel adjustments clearly. mercy, that would help so reinstalling back plate doesn't bend over led battery lights of prerefined flys. with time we can stand back and evaluate the vibrato bridge. 1. the posts lean forward, same as old les paul jrs. 2. the vibrato arm is michrophonic with the fishman piezzos on the prerefined flys, inducing noise. 3. vibrato springs require annual replacement. do they still make them?? 4. cheesy plastic step-stop on prerefined flys clicks off when slinging prerefined fly guitar on stage. there may be an aftermarket metal replacement. Ya a chrome step-stop would be amazing :-) I bet it would help with keeping in perfect tune if you play with the step-stop down too. Just a thought. Let's not start repeating this rumor ad infinitum. It's based on a single recent comment from an unknown Parker employee reported here second-hand. Where was such a recommendation over the last 21 years? I say pish-posh hogwash. Seconded. Yes they still make them. No, they are not a 'wear' item, and typically do not require replacement unless stressed beyond specification. DEFINITELY not on 1-year intervals. That's ludicrous. I totally agree with the move to offer affordable made-in-Asia models. These are great for introducing the Parker brand to those who have never heard of it. By putting lower-end Parkers into the hands of youths and beginners, this will culminate in some of these players going for the premium made-in-USA models 5/10 years down the road (e.g. after he/she graduates and gets a job). However, in developing countries (such as in Southeast Asia), where there's a huge market for affordable guitars, the availability of Parkers in brick-n-mortar shops is severely limited. For example, in Southeast Asia, I think that there’s only 1 store in Bangkok, Thailand, and another in Indonesia. I live in Singapore and Malaysia and have only ever seen a single used Parker Fly. That’s insane, considering the fact that the PDF series guitars are made in Indonesia! Parker Guitars, you need to start building ties with distributors to get your guitars into physical stores so that they are out there for people to see, feel, experience. For the made-in-Asia models, target the younger generation and get salespeople to promote these guitars. These younger people are less likely to be fixated on the 2 big “conventional brands” of guitars. Trust me, Asians are generally smaller in stature; a lightweight, slim-bodied, comfortable guitar could be very attractive compared to 10 pound+ anvil of a guitar by a certain manufacturer. The same goes for people residing in cities where the majority relies solely on public transport. Getting to a gig without a backache is not a bad thing at all. To summarize, the easily affordable line of Parker guitars has the potential to put the Parker brand out there. However, these guitars need to be of a certain quality, and they need to be readily available to be seen, tried, bought, and gigged with. Word-of-mouth and experience will do the rest.